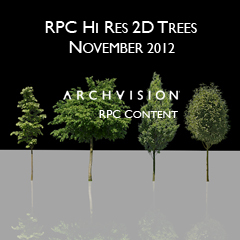 ArchVision proudly introduces four new hi-res RPC tree additions. This collection includes ginkgo , a small but hardy tree, deciduous tree , a dense narrow tree, deciduous tree , a nice round-topped tree and deciduous tree  with wide reaching branches. These trees are ready for download via the ArchVision Dashboard.